FiiO Has Won the iF Design Award 2019 with the Mighty Bluetooth Adapter BTR3 - Hot news - FiiO Forums - Powered by Discuz! We are proud to announce that FiiO has just won an iF Design Award 2019 with our mighty Bluetooth adapter BTR3. The iF DESIGN AWARD is one of the most important design prizes in the world. Winning an iF DESIGN AWARD is a seal of quality for exceptional design and outstanding services. For consumers and users, it is a symbol they can trust. In 2019, 67 design experts from 20 countries selected the best designs out of 6,400 entries from 50 countries. 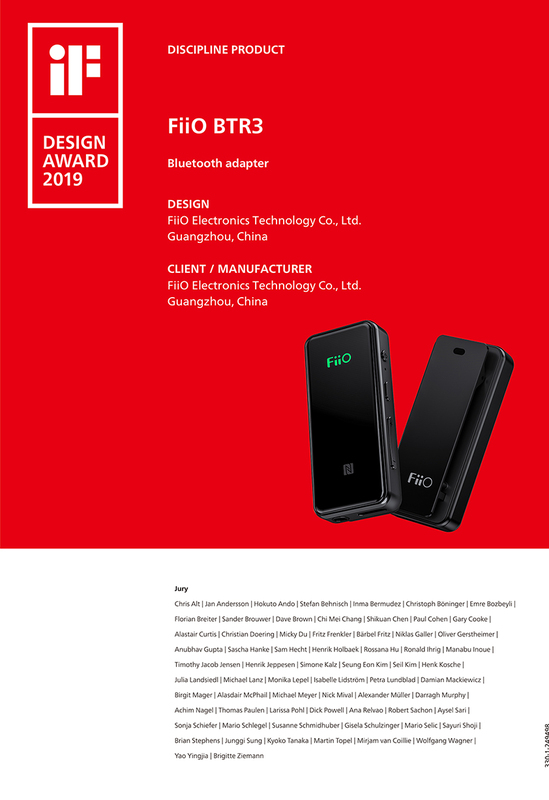 After an intense examination and judging period, FiiO Bluetooth Adapter BTR3 had won the affection of the jury and been chosen as the winning entry in the category of DISCIPLINE PRODUCT! This is the 4th iF Design Award of FiiO following the Q1 Mark II and BTR1 in the 2018, and X5III in the 2017. And it’s the 8th award of BTR3 itself following the 2019 VGP Gold Award in the Portable Headphone Amp, Enjoy the Music 2018 Audiophile Gift, 2018 Autumn Headphone Festival Silver Award, iLounge 2018 Holiday Gift Guide, Gadgets360 Best Audio Products of 2018, Headfonia 2018 Award and Headfonics 2018 Award. Must be the most awarded Bluetooth adapter in the world, isn’t it? Thanks #iFDesignAward and all our customers! We will keep up the good work and bring more outstanding products to the market. GMT+8, 2019-4-25 12:30 , Processed in 0.021113 second(s), 23 queries .